Bombshell baby. Nick Young&apos;s ex-girlfriend Keonna Green, who is pregnant with the athlete&apos;s second child, spoke exclusively with Us Weekly about their relationship, her pregnancy and what&apos;s next for the pair. Green, the owner of L.A.&apos;s TNK Hair Studios, is 22 weeks into her pregnancy. She says that Young, 31 — with whom she already shares son Nick Jr., 4 — was "shocked" to find out that he was going to be a dad again. 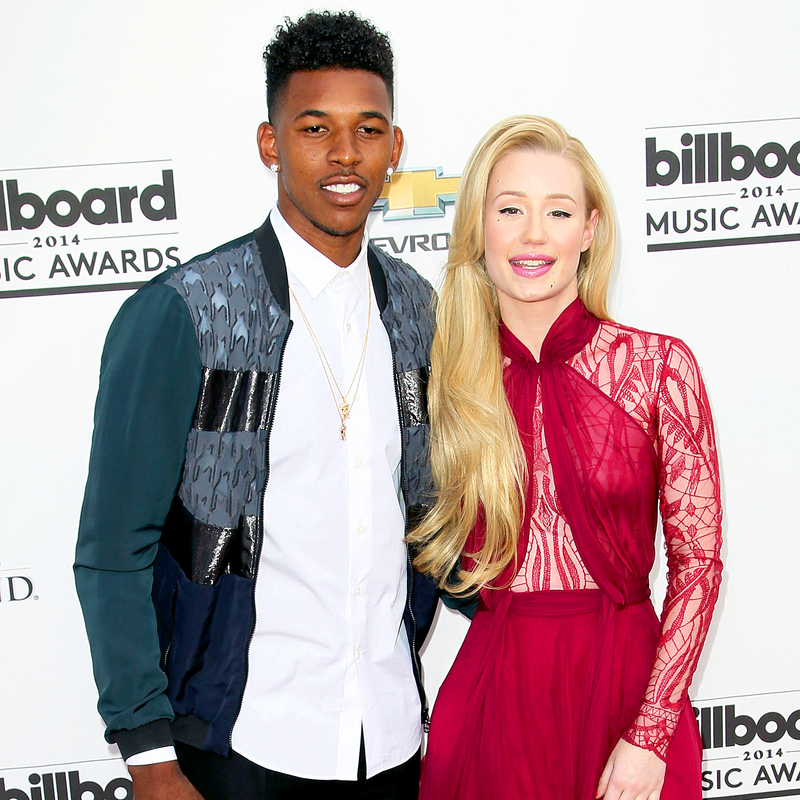 Young announced his split from Iggy Azalea on June 19. The pair began dating in 2014 and got engaged June 2015. In March, a video surfaced of Young allegedly admitting to cheating on the Australian rapper, 26. According to Green, she and Young rekindled their romance in September 2015, three months after he proposed to Azalea. She says they&apos;re no longer intimate, but admits she&apos;d give him another chance. US WEEKLY: How did you and Nick first meet? KEONA GREEN: Nick and I met in high school in 2002. I cheerleaded; he played basketball. We kind of instantly connected. I actually had the crush on him first. My way of trying to lure him was to give him … those cookies they have from Mrs. Fields. … My cheerleading squad, we had to do a secret Santa–type thing for the basketball players, so I basically went up to all the girls on the cheerleading squad, saying, "Whoever has Nick, I want him." US: What endearing qualities did he have to get your attention? KG: He’s actually a very caring guy. It’s a lot of things that people can see, people can see his personality through basketball … He has great parents who raised him to respect women. He just can’t help the type of field that he’s in, so of course he’s going to attract a lot of women. US: Was it an even-keeled relationship or were there a lot of ups and downs? KG: No, I wouldn’t say there were a lot of ups and downs, but when we did have ups and downs, at that point, we were very young. It wasn’t anything too serious. We would fight, then get over it. I was kind of like the territorial girlfriend. I was like, “Wait a minute, what is he doing, which hallway is he down?” Things like that. Of course a lot of women were, I guess you could say, flocking towards him. US: Would you get insecure and think he was cheating on you? KG: Actually, to be honest, I was really into myself in high school. I was the captain of my cheerleading squad; he was captain of the basketball team. He was the man, so we kind of matched each other. I was really confident. US: What are the challenges of being with a basketball star? KG: OK, let me tell you, being with a basketball player then and now? Totally different. … I guess I would say it was different back then because now, I’m not the captain of anything. I’m just the mother of his child. Whereas back then, I was the captain of my cheerleading squad. So whatever he could do, I was just as good at it. It’s completely different now and then. US: Did you want to marry him? KG: Of course. Let me tell you, this is a little deep into the conversation, but I can count how many people I’ve been with on one hand. And Nick was the person I thought was it for me. When I went back that second time, I was thinking, This is it for me. US: Let&apos;s talk about your relationship with Iggy. KG: I found out through TMZ [in 2013] that they were dating. I inquired and there was denial. We had a rough patch from there. A couple of months into them being an item, she was moving into the house, so I called her. When I was dropping my son off, we met in the living room. I didn&apos;t want my son around somebody I&apos;m uncomfortable with. I said, "Please, out of respect, don&apos;t post photos of my son." I didn&apos;t want people thinking I&apos;m not in his life. She was like, "I completely get it." Reality set in that me and Nick were over. She was in the house I used to stay in. I cried on my way home. But Nick Jr. had fun with them. He would always say, "My daddy and my Iggy took me to Target and got me this." Check out Christina Garibaldi and Ian Drew dishing on all the latest on this story during Us Weekly&apos;s Facebook Live News Update.